Our party bus rentals can carry a number of people in just one ride, from 15 passengers to 50! They also have a lot of features that one would truly love to have with a family bus. Most have luxury seats, plenty of space to move about, the latest audio and video equipment, gaming systems, the latest lighting and so on. A party bus rental is definitely the latest in luxury group transportation service that you can hire in Apopka. If you are traveling with less than 20 passengers, try one our Limo Service Apopka! What would transportation services be without your very own private driver? No fun! With our service your own driver will safely take you to different places in the city and will also provide you some recommendations should you need it. You can ask your trusty driver to give you some tips to take advantage of great things in the city as well. 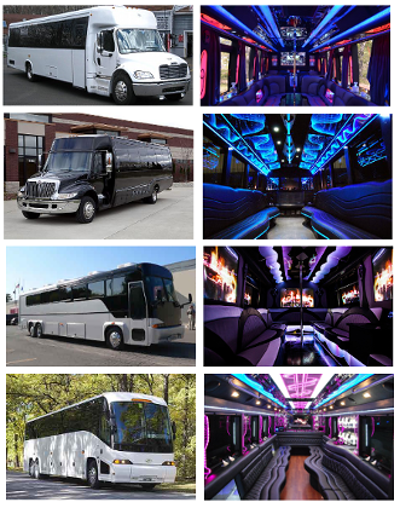 It is fairly easy to book your party bus. You will only need to call and tell the operator that you want to hire a party bus for a specific date and time. Most of the time you will be asked only a few questions about your identity and some credit card information to process your reservation. It can help if you book in an earlier time so that you can reserve your ride the earliest time as well. Your reservation will also be kept private as well as all the information that you have submitted. You can count on our company to pick you up on time without any kind of hassles at all. Let our customer service team walk you through the reservation process, call 407-374-2370. Rock Springs Run – visit this fantastic place where you can do all kinds of outdoor activities especially running and jogging. United Artists Wekiva Riverwalk 8 – this is a fantastic movie theater with state of the art facilities. It is a great night to watch a movie with your friends! Errol Estate Country Club – this is a wonderful golf course with challenge in every corner. Take time to visit this with your Apopka party bus. Tell your party bus chauffeur to pick you up at the Orlando International Airport and to take you promptly to your meeting or to your hotel. You may also visit nearby cities with your private party bus Apopka FL service.